Today, when you order "Card on Ceiling Wax 50g (Sharpie Grey) by David Bonsall and PropDog", you'll instantly be emailed a Penguin Magic gift certificate. You can spend it on anything you like at Penguin, just like cash. Just complete your order as normal, and within seconds you'll get an email with your gift certificate. 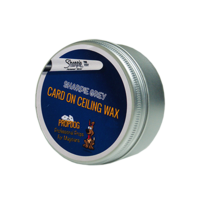 The Card on Ceiling trick has been around for many decades and was originally performed with tacks but over the last few decades, magicians have been using wax as an alternative. At PropDog they came up with what they think is a great improvement to the wax and that is to add color to it. This has many advantages depending on how you perform the effect. For example if you use a method where you store the wax in a tub, then you can use either Bicycle Red or Bicycle Blue wax and once on the card, it will be far more invisible. This way, if you were to accidentally flash the top of the cards whilst performing the trick, it is far more unlikely that the spectator will notice the wax. Many magicians use a method where they store a tiny ball of wax on the end or the lid of their Sharpie, so we came up with the idea of coloring it to match the Sharpie. This way, the ball of wax is completely un-noticeable and stolen as you recap the Sharpie. The Sharpie Lid Black is the exact color match for the Sharpie lid, so will not be noticed by a spectator and is also great if you store your wax on your belt ...if you're wearing a black belt that is. The same is achieved with Sharpie Grey if you want to store a wax ball on the bottom of your Sharpie. 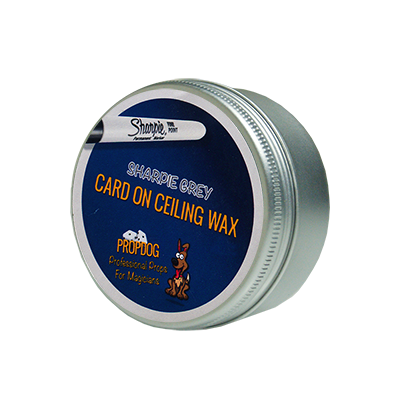 The PropDog Card on Ceiling Wax has been specially formulated in conjunction with a dedicated wax manufacturing company to be of the perfect consistency for this trick. It's not so sticky that it leaves a sticky residue on your fingers, but sticks perfectly to ceilings and walls and means you can use smaller amounts, giving you more performances per tub. The color has also been carefully pantone color matched and the colorant is wax based, so will not stain the ceiling. Note: A 50g tin of wax will give you enough wax for approximately 300 performances. Please note that these tins only contain Card on Ceiling wax and they do not come with a routine or instructions on how to perform the effect.